Order doesn't matter one bit. The Zelda games are self-contained enough that you can jump into just about any game and play them in any order. ALttP and OoT are good starting points, since they are the most heavily referenced, but otherwise you are good. If you wanted to follow a specific order, I would recommend against timeline chronological order, since it might result in deceptive expectations. For a good chunk of the Zelda games, fans had absolutely no idea where they were placed in the timeline until very recently. The timeline connections tend to be very weak. Release order is better in that regard, since it lets you see how the recurring elements of the franchise evolved over the years, which is much more significant. The only thing that was really ever unclear was the placement of Zelda 1-3 and related games relative to everything else. Most of the Zelda games were shown to be before or after other games. See that's what I figured from playing WW and stuff that they all seemed pretty self contained. I played 1 a couple of hours a year ago or so and thought it still had some charm to it. Wasn't it available for free on 3DS for a bit? That was the Four Swords extra from LttP on the Gameboy Advanced. The old man does use the word "decline" (era of decline?) in explaining what happened to current Hyrule. Although I believe this takes place after spirit tracks let me try and fit this in that era. At this point, they should just say this takes place in the "Fallen Hero" timeline and end the other two. It's time for a timeline reboot. The reason the Zelda timeline is so screwy because Nintendo doesn't really care about the "canon." Time for a clean break and a fresh start. I'll never understand why people keep saying this. It's painfully obvious Nintendo cares about the timeline, the fact that they've been reiterating how the timeline works for well over a decade AND continuously updating it as recently as Triforce Heroes reinforces this. They haven't changed anything about what they've established in Hyrule Historia either - in fact they're still marketing it and pushing its relevance to the franchise. There's absolutely no need for a reboot in a series where the connections between titles are usually just subtle background pieces to begin with. I still think the original LoZ/AoL Link is a good contender for BotW. The entirety of AoL is him going on a quest to awaken the sleeping Zelda. All the while minions of the now dead Ganon are trying to kill him to gather his blood in order to resurrect their fallen Prince of Darkness. So while the Fallen OoT Link is a good candidate since we know he loses at the hands of Ganon, AoL isn't too bad either. He's young at only 15/16 which BotW Link seems there abouts. There is an already established need for him to be gutted in order to bring back Ganon and that issue is never resolved in the game. Link simply succeeds in rescuing sleeping Zelda and the game ends. Ganon's minions are still out to get Link and his lovely blood. I don't like the idea of the fallen hero timeline. It adds a very lame "what if" angle to retrofit games into a saga that wasn't well-defined when they were made. A game needs to be made to depict this "what if" scenario to tie it together. Start a game with the hero of time getting killed, or keeping him sealed in time rather than emerging with the master sword. Hm, maybe that is where this game fits. Child Link pulls the sword, but rather than Adult Link emerging seven years later, he is sealed. He was assumed dead, leading to the fallen timeline. It can be salvaged. I really think the overall saga is a secondary concern with these games, so I don't really think about it too much. But I can't help but be annoyed by the fallen timeline. The hero prophecy mentioned in aLttP had two different outcomes. They could have used that as an excuse for the fallen hero timeline, since it applies perfectly to OoT's scenario, but the fact that they didn't acknowledge this directly makes me think they didn't even remember it when organizing that branch. "...Do you know the prophecy of the Great Cataclysm? This is the way I heard it... If a person who has an evil heart gets the Triforce, a Hero is destined to appear... ...and he alone must face the person who began the Great Cataclysm. If the evil one destroys the Hero, nothing can save the world from his wicked reign. Only a person of the Knights Of Hyrule, who protected the royalty of Hylia, can become the Hero..."
Personally I've thought since the moment I saw the game that it's a sequel to Wind Waker after the water dries up and that we're playing as a grown up Toon Link. If that's the case, it would be Spirit Tracks' Link. This is an old video posted on YouTube featuring textures that didn't appear in Twilight Princess that were added in Twilight Princess HD. It was extremely hard back when the video was first posted to tie it in to anything, but knowing what we know now (still, not much) is it worth going back an taking another look at this? my final prediction: the voice is from the sacred realm calling for the awakening of the final sage, Link. thus requiring his death, the ultimate sacrifice, at the end of the game to seal/destroy Ganon for eternity. the speech given to you after you pick up the master sword in the temple of time talks about an ''awakening voice from the sacred realm calls upon the sages''. i think Link is a sage in BotW. he wouldnt know it, Saria didnt know it. Also its pretty much confirmed that Sages have to die, right? anyways, its a half baked theory but its my theory. Would make sense if it was the last Zelda game ever. but it won't be. Before Wind Waker Hyrule had to be drowned to seal Ganon away. All the Guardians look like they were surprised by something and then shutdown. Link didnt appear in this history because he was absent (asleep?). The koroks planted trees for a future where the oceans dried up and here they are again in Botw. We are told Ganon is still sealed away in the castle but already very close to actually breaking his seal. They only part that doesnt fit are the hundret years. Link had to be asleep for thousands of years to support this theory. Well...his theory's wrong, for starters, although the images are interesting. I wish he had shown what was there in the original version, at least. So...this has me thinking that...this is indeed the Hero of Time, as it's child Link, the Link that left for Termina and supposedly never showed up. Hence, Wind Waker timeline. So yeah, this might be the actual story behind Wind Waker's opening. The black shadow coming down from Death Mountain to take over Hyrule, again, as depicted in that opening. It could be set right before Wind Waker. This could be the moments before the gods flood hyrule, as Ganon basks in his conquest. Maybe Ganon was able to go back in time and tried to kill Link as a kid, which led him to be in the resurrection chamber? Do we know how much time there was between OOT and WW ? Were the creatures of the WW islands here before ? I think people are reading too much into the 100 years thing, drawing a direct connection to OOT based mainly on Aonuma's roundtable tease. There's a Shiekah connection, and Link has slept for 100 years. Could be something completely different set millennia after TWW. For some of the big 3D Zelda games, sure. But I don't think anyone was really that certain about games such as Minish Cap, the Oracle games, or the various Four Swords games. The fact that the timeline was so fuzzy for the first three games in the franchise is also a very significant detail that can't be brushed aside. While people figured out the split-timeline theory, I never saw any general consensus on where all of the games fit together. It is also the case that the breakdown of three timelines that was revealed in Hyrule Historia surprised just about everyone. Up until that point, everyone just presumed that it was a timeline with two branches, since that is what made sense based on all available theories and dev answers. Can you honestly say that you knew where Four Swords Adventures was in the timeline when the game itself was released? FSA came out of nowhere but majority bet on Minish Cap and FS taking place before OoT. Even then, FSA was a mystery due to Ganon's appearance in the game. I think many most expected it to take place after ALttP. The clothes Link picks up says they're a bit small, so they were obviously intended for a child Link. Unfortunately Link has aged a bit. So I'm guessing he was put in this stasis as a child, but woke up older (not 7-years older, because he still looks kinda tiny compared to the old man). You're thinking of what happened to his body during those seven years. But it's his soul that was traveling through time, not his body. His body didn't simply disappear and then reappear in the future. It was kept in the Sacred Realm, where he aged while his body slept. At the end of Ocarina of Time, though, it's clear that when Zelda sends him back in time, he disappears, body and soul. That's why the Hero of Time is completely absent in the TWW prologue. Ahh. I understand that at the end Zelda sends him back. However, I was more referring to the mechanism whereby I could transport back and forth as much as I liked, simply by pulling out/re-seating the master sword. I forgot about 4 swords. Those were a bit vague, too. But my overall point is just that the timeline wasn't just complete guesswork before the Hyrule Historia. People did have a pretty decent idea of where many of the games fit in. This is why time travel plots require a significant amount of suspension of disbelief. Using the logic here, Link's "soul" is transported back to the body that was left sleeping whenever he sheathes the master sword. He keeps waking himself up, basically. But the logic here also states that everything Link does between sleeping and waking was always done and he didn't sleep for 10 years or whatever, he just slept for a few years of that. Crystalis takes place in a post-apocalyptic world, one hundred years after a global thermonuclear war has reverted civilization to a primitive, medieval existence populated with fierce mutated creatures. Science and advanced technology have been abandoned, though the old ways of magic have survived. I think it would be interesting if it had some impact on the story... but the appearance of both the Rito and Zora is perplexing. Hell, just the appearance of the Rito in the Child timeline shouldn't happen. This is something I think we'll have to wait and figure out, I think. That'd be very depressing knowing from the start of the game that it has to end in you pretty much failing and Hyrule being flooded. I doubt that it's this case. The problem though IMO is if Links in "stasis" he shouldn't have aged at all, I mean stasis is a state of equilibrium where things don't change, ect. If he was time traveling like in OoT then going from young Link to old type works, assuming the chamber he wakes in BotW is for time travel...I almost like to believe the Sheikah cave is more of a gate, powering the Temple of Time and allowing Link to traverse between multiple Hyrule timelines, hence age. I know these are probably some pretty broad strokes that open up a lot of holes but I find it pretty convenient that there are so many locales from various Zeldas it seems rolled into one. The plateau in BotW I think pulled from various times and birthed both a new ledgend and a Hyrule that feels like the epicentre of chaos. If the Ooca are back in Breath of the Wild then it's a hard pass for me sorry. No matter how fantastic and amazing the game looks I can't suffer through those nightmares again. NO GET AWAY FROM ME SEXTUPLE BREASTED CHICKEN! NO I DON'T LIKE YOUR HEAD BABY! But Old Man said this is where Hyrule was founded. The ToT was the Sealed Grounds/Temple of Hylia from Skyward Sword. That land became the Temple of Time and Castle Town in Ocarina of Time. Honestly...nothing is lining up so far. But I think we can agree that this is the same Hyrule from OoT and beyond. Although Death Mountain should be behind the Temple of Time...Sigh. I'm sure the old Death Mountain from OoT is actually Mt. Hylia in BotW. Also, you can see the Hylia River flowing right in front of it, which could be the small river in front of the entrance of Kakariko Village which goes to Zora's Domain. Sure, the geography is not exactly the same, but let's not forget the N64 didn't have the power to render such a big map. And also, the events with Calamity Ganon and the time span could also reshape the land. 100 years after OOT is when Ganon breaks out and it;s said that's when the flood starts. The beginning of Wind Waker is a couple of hundred years after that. I miss her and want to see Link find her dammit! LET A BRO DREAM! Ganon attacks the kingdom of Hyrule and steals the Triforce of Power. Zelda breaks the Triforce of Wisdom into 8 pieces before being captured by Ganon. Link saves Impa and decides to retrieve the Triforce of Wisdom, defeat Ganon, and save Zelda and Hyrule. The Triforce of Wisdom and Power are introduced. Several years after Zelda 1, Link is now 16 when the Triforce crest appears on the back of Link's hand. Impa tells like about the 1st generation sleeping Princess Zelda (another Zelda, different from the first game's princess), and the 3rd Triforce, the Triforce of Courage is introduced. The backstory reveals the King left Power and Wisdom in the kingdom, but sealed Courage in the Great Palace for a reason. Link needs the full Triforce to wake the sleeping Princess Zelda and bring peace to Hyrule which was on the road to ruin from the remains of Ganon's influence. Zelda II was made by a different team than Zelda 1 but still had Miyamoto producing. - The back of both the U.S. and Japanese box both reveal the game as a prequel to the NES games. The U.S. box refers the the predecessors of Link and Zelda, while the Japanese box refers to a present time before the character Link accomplished his quest. "This act (note: as in a play) takes place once upon a time before when Link flourished, an era when Hyrule was still but one kingdom. Run, strike things, carry things (note: also can mean "do tricks"), and throw things. The backstory and artwork that appears in the manual, including the depiction of the 3 goddesses, the sages, the Golden Land, and the origin of the Triforce and Ganon was written by Yoshiaki Koizumi. The 1992 Nintendo Power Player's Guide also gave the order of ALttP -> Z1 -> Z2 and summarized all 3 games. The August 1991 issue of Nintendo Power previews "Zelda III" and explains it "Links with the Past" in that it stars the ancestors of Link and Zelda, also named Link and Zelda. This is the first time a new Link has been introduced, but was only part of the backstory. After Link defeated Ganon in A Link to the Past, he went on a training mission and was on his way back to Hyrule when he was shipwrecked on Koholint Island. The backstory including the island and dream were written by Yoshiaki Koizumi, who also wrote the backstory to A Link to the Past. Yoshiaki Koizumi was working on a version of Zelda II using flatshadded polygons on the SNES before being pulled to work on Super Mario 64. Yoshiaki Koizumi was assistant director on Super Mario 64 for his 3D system skills working with Miyamoto. Ataru Cagiva's Triforce of the Gods (ALttP) manga was made as a followup to his Link's Awakening manga as a prequel (The end of the ToTG manga leads into his previous LA manga). Ataru Cagiva's ALttP manga depicts the spirit of the previous hero who wielded the Master Sword during the Imprisoning War but failed against Ganon's technique of darkness. Miyamoto mentions Ganon from the SNES game is in human form before he becomes a monster. Yoshiaki Koizumi serves as 3D System Director and is one of the original 3 staff members on the Zelda 64 project, working alongside script director Toru Osawa, and is heavily influenced by Zelda II: The Adventure of Link. Nintendo of America and Nintendo Power publish an interview with Miyamoto on Zelda.com with additional questions answered in an upcoming Nintendo Power issue. Miyamoto gives an order of Ocarina of Time -> Zelda 1 -> Zelda 2 -> ALttP. This contridicts previous evidence, and was likely mistranslated, with Miyamoto first saying "Ocarina of Time", pausing, then because of the way Japanese seems to be translated in reverse said something like "Zelda 1/Zelda 2" OF "ALttP", which should have been translated in the reverse order. Satoru Takizawa character designer for Ganondorf admits OoT wasn't an original story, and they were dealing with the Imprisoning War story from the SNES game. Toru Osawa, creator of Kid Icarus and OoT Script Director, explains they gave the sages the names of the towns from Zelda 2 so it would look like the towns were named after them as the Imprisoning War story was passed down. The NCL website for Link's Awakening DX mentions the game is a sequel to the SNES Zelda, A Link to the Past, with a Quick Time movie showing Link destroying Ganon. An interview with Miyamoto transcribed from Jan 1999 in Dengeki Nintendo 64 gives an order that's consistent with what has been known. Nintendo of America's Zelda.com, along with the Ocarina of Time Player's Guide by Nintendo Power, begins to get very loose on the series canon. Zelda.com portrays Link as 1 hero, and at one point suggests Link's Awakening taking place during the raft ride of Zelda 2. Majora's Mask takes place several months or 3 months after Ocarina of Time with Young Link. The project was originally titled "Zelda Gaiden", as in "Zelda sidestory". Yoshiaki Koizumi co-directed with Eiji Aonuma. - Realistic tech demo with adult Link and Ganondorf from OoT facing off. Capcom development team Flagship create 2 Zelda games based on Link's Awakening DX. The ending depicts Link setting off on a ship similar to the one from the beginning of Link's Awakening. Eiji Aonuma becomes producer of the Zelda series and takes it into a different direction than the Spaceworld 2000 tech demo, resulting in the toon-shaded GameCube title,The Wind Waker. Aonuma and Miyamoto reveal The Wind Waker takes place over a hundred years after Ocarina of Time and that there were 2 endings. Link being a new hero also named Link is part of the game's story instead of just part of the backstory. Aonuma explains that The Wind Waker is a stand-alone story, but players who played Zelda before will understand the references. Miyamoto mentions that they tell a new story with each Zelda, but they have a document that explains how each game connects together. Aonuma mentions GBA Four Swords as the "oldest" tale in the timeline, with the GameCube FSA taking place sometime after that. The Four Sword games and The Minish Cap were intended by Capcom to be another story taking place in Hyrule separate from the Triforce story. Eiji Aonuma reveals Twilight Princess is parallel to The Wind Waker, taking place during the child era ending of Ocarina of Time where things play out differently. Miyamoto and Iwata explain that when the story of a series like Zelda has built up over time they can't disappoint fans, so they made Ocarina of Time's story with reference to the previous games. > 2011 - Hyrule Historia reveals the Zelda timeline and puts it in print. Timeline connections that were consistent over the years are still maintained, and a 3rd branch in the timeline is revealed. Skyward Sword, Phantom Hourglass, Spirit Tracks, etc need no explanation. Triforce Heroes is revealed as a sequel to A Link Between Worlds on Nintendo's twitter. Four Swords, Four Sword Adventures, and The Minish Cap were connected but their relation to the other games was unknown. Four Sword Adventures has locations from A Link to the Past and The Legend of Zelda 1, so its place in the timeline parallel to A Link to the Past makes sense. The GBC Oracle games hinted at a connection to Link's Awakening which they were based on, which was already a sequel to ALttP, but don't have anything really to do with ALttP. They're like "another story" scenario wedged before LA. Ocarina of Time was already a prequel to A Link to the Past and the original Zelda games, but then The Wind Waker was a sequel, and Twilight Princess was also a sequel. Zelda is a series where they create the gameplay first, then make the story around that. Each game's story stands alone, but players who played previous games will understand the connections. Watched the video and it makes a lot of sense....I actually hope its that Link. Zelda aLTTP is my favorite Zelda and Id love to ride with that hero again. Hes badass. This one makes the most sense to me as well. Though I was hoping this game would be a complete reboot and have a properly planned out mythos and timeline which future games could build upon. That's a good video, although I'm not sure the argument on geography is entirely helpful, as that is clearly not a priority at Nintendo. Also, the sword was in the forest before ALTTP. HH says that there was originally a temple there, but does not specify that it was the ToT. Not to mention, in ALTTP, the forest is NW of Hyrule Casle. Nintendo are clearly influenced by the first Legend of Zelda, but that doesn't necessarily mean that BotW takes place in that era either. I do think that bit about the old smaller clothes is interesting, though. Shouldn't Link have been sealed up w/ his Hero garb if he were OoT Link? Then again, ALTTP Link is at least 17 by the end of all his currently known adventures and should also be done growing. Also, we never saw Skyloft proper fall to the ground in SS--only the Isle of the Goddess. The region surrounding the ToT in Twilight Princess correlates to the Sealed Grounds of Skyward Sword. Although the existence of a notable plateau here may indicate there's a bit of a re imagining going and the area is supposed to be the fallen Isle of the Goddess. Interesting note that in the HH, there is an early piece of Skyward Sword concept art which has "Skyloft" labeled as "Hyrule". I have a feeling there is going to be good amount of retconning for this game. Not that this is a bad thing. Great post! Thank you for resuming it all with sources! We've now seen areas/characters from Skyward Sword, Ocarina of Time, A Link to the Past, Zelda 1, Wind Waker, and Twilight Princess. So do we have more details to determine its part in the timeline? His videos are excellent, but I certainly agree with his first video more than his second. For any of you less well-versed in the Zelda timelines, I'm going to try to summarize everything, and present where I think Breath of the Wilds is as best I can. THERE ARE A FEW SPOILERS SPRINKLED THROUGHOUT THIS EXPLANATION. At the end of Ocarina of Time, the timeline was split into 3, the "Fallen Hero" timeline, where Link is defeated by Ganon, who gets the complete Triforce and rules Hyrule. Eventually, the sages manage to seal him and the Triforce in the Sacred Realm. He remains there until the events of A Link to the Past, where he escapes, before being defeated by a new Link, who claims the complete Triforce. This Link then leaves Hyrule, where the events of the Oracle games and Link's Awakening take place. Long story short, the last time we see him is clutching to a broken ship at the end of Link's Awakening, his fate is unknown. The next game, A Link Between Worlds, features an entirely new Link, but a similar overworld to LttP. Strangely, in this game Ganon isn't dead, but sealed away with just the Triforce of power, while the other two pieces lie with Zelda and Link, implying there is another game between Link's Awakening and A Link Between Worlds. However, since that game as an intact Hyrule as seen in LttP, Breath of the Wild cannot lie there. Anyway, Link saves the day and the Triforce is passed down within the kingdom. According to Hyrule Historia, the kings of Hyrule feared misuse of the Triforce, and thus split the pieces and hid them. When a new Ganon emerged in Zelda 1, Link had to find the pieces again to defeat him. also appears as the Hero's Shade, who lives on with the regret that he isn't remembered as a hero, until he passes on his skills. Also, Four Swords Adventure happens after Twilight Princess, but it's not as relevant. The final timeline is the "Adult Link" timeline. Again at the end of Ocarina of Time, Zelda sends Link back to his past, and she is just... standing there. Following her viewpoint, Hyrule is rebuilt, but Ganon eventually escapes and attacks Hyrule. No new hero emerged, so the Goddesses flood Hyrule and seal Ganon under the ocean. Eventually he escapes, and is defeated by a new Link in Wind Waker. This Link then leaves the Great Sea for a new land, as chronicled by Phantom Hourglass and Spirit Tracks. So! Where does this leave Breath of the Wild? I personally believe that this takes place in the Fallen Timeline, and this Link is the Link from LttP/OoX/LA who was in stasis for ages. Since he was alive, a new Link couldn't be born, so when Ganon returned, he destroyed Hyrule. Eventually Zelda discovers he is alive, and finds a way to awaken him, which starts the game. There are some inconsistencies, such as the species from Wind Waker appearing, and the Deku Tree, I'm eager to see other theories about this. Thinking things over again and watching some videos I'm still thinking this is either after LoZ/AoL or after TP to a lesser extent. But not actually direct sequels to either. This is most likely a new Link, not a returning one we've seen before. Having the game fill in the aftermath of the Downfall timeline and represent the Imprisoning War requires a lot of extra stuff to happen otherwise it makes no sense due to the existence of this new Hyrule Castle, Castle Town, the Guardians and a bunch of other stuff. From the cutscenes we've seen none of it matches up right. Great Deku tree is full grown when Zelda places the Master Sword there after Link is apparently defeated, when in Adult Timeline he should only be a sprout. She and him are fleeing Guardians that overran and destroyed TP's Castle Town, not the OoT town and castle, which shouldn't exist. And old Hyrule Castle is gone and replaced with an Eastern Abbey, suggesting the old city, ToT and castle were rebuilt but as a holy site, not capitol. Impa talks about Calamity Ganon as a primal evil that the royal family has endured over the ages. Technically she could be referencing Demise, but could also be actually referencing Ganon himself, who in, especially, a post AoL, or even TP, setting would have been a force the royal family has had to face for many generations. And in both scenarios he is not simply trapped in the Sacred realm like he would be in an Imprisoning War setting, but he's technically dead and ethereal like we see in this game. Obviously Nintendo is not above contradictions and inconsistencies between games, but if they were really going to be setting up a direct sequel to arguably their biggest title in the series I don't see how they could introduce so many when many fans are intimately familiar with that world and setting. Where as placing the game after AoL or TP is fresh territory, especially the former. Breadth of the Wild clearly takes place after Wind Waker, in the "Link wore pajamas" timeline. The Hero of Time wore blue pajamas, and now the people of Hyrule think the famous clothes are supposed to be blue. 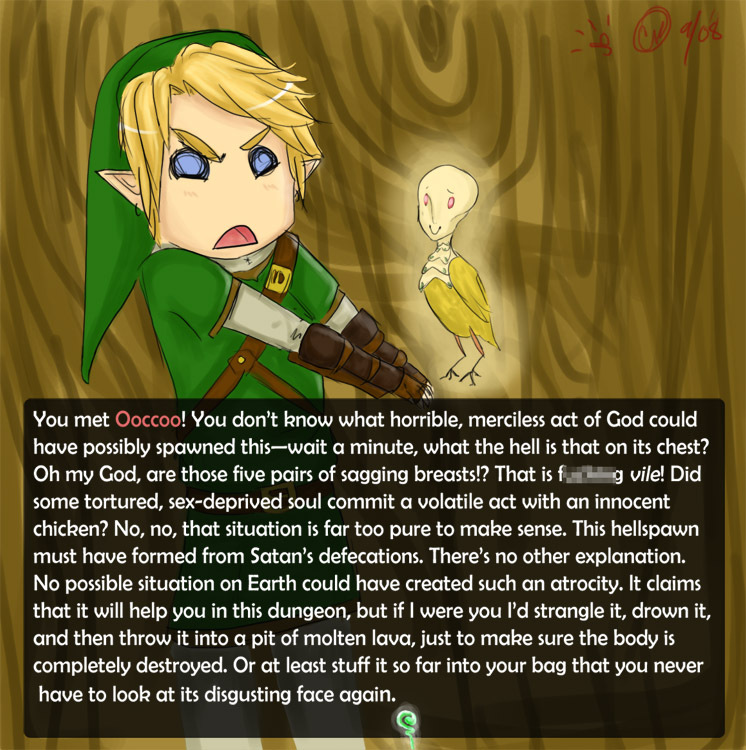 That's why Link wears blue clothes in Breadth of the Wild. The only thing I didn't instantly agree with was the theory that Link has been put into statis for round 2 with Ganon. The Shrine we wake in is called the Shrine of Resurrection. I'm still convinced Link dies 100 years before BOTW. Zelda does what she can to seal Ganon and he has been regaining strength to break free as Link is woken. EDIT: new theory in new video. Watching now.